I'm going to borrow part of my old review in describing what this book is about in case it is new to you. 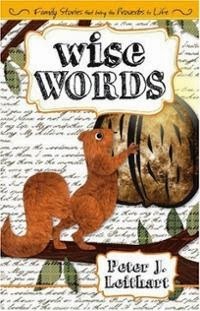 Wise Words is a collection of eighteen fairy-tale style stories which each have their own moral, based on a Proverbs (from the Bible). Each story is roughly 3 pages long and is full of princesses, kings, peasants, jewels, wizards, apples and nuts. If you are looking to teach your children morals through stories, this is a collection you might consider. Just as the Book of Proverbs assures us, all stories do not have a happy ending and this book follows that reality. The characters within who make foolish choices, or who are full of pride and arrogance, meet difficult to doomed endings. Those that seek to do right meet with success and their own happily-ever-afters. The stories are not neat and tidy and, I would say, are rather on the edgy side. I would liken them more to Grimm than you'll find in most picture books these days but I did not mind this as it kept my children in rapt attention. We were never able to relax in any one particular story because you were never sure of the ending. Wickedness is not pretty and it is not supposed to be. Sin is not a happy thought, especially that which is not confessed and dealt with! At the conclusion of every story there is a moral in the form of one verse from the Book of Proverbs. For example, the story of The Fragrant Garden teaches that a false witness will not go unpunished (Prov. 19:5), The Monster's House teaches that a man's ways are ordained by the Lord (Prov. 20:24), and A Cloud of Birds teaches that wealth is fleeting (Prov. 23:5). I like the uniqueness of Wise Words as a devotional book. I'm not usually the "devotional" sort and so appreciated stories with a moral attached. Our kids just assumed we were reading stories and that's rather how I like it. All of life is an example to us of how to do right and hate evil. Whether it be from the people in our lives who provide examples, to the movies and tv we watch, to the books we read, there is always something for us to learn. If you have an interest in working through the Book of Proverbs with your kids and are looking for resources to help you out, this might be one that you would want to consider. It's definitely a bit off the beaten path but the journey is surprising and fun.